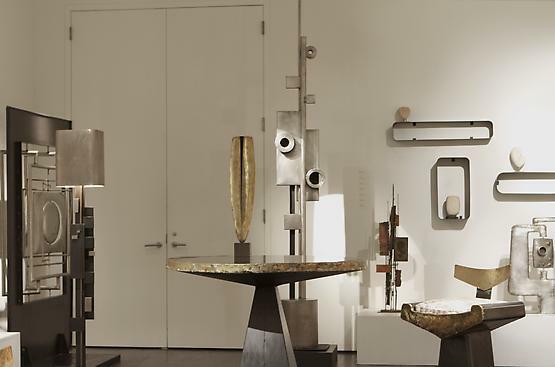 Douillard "Le Forgeron de Fer"
Magen H Gallery is pleased to present the first retrospective of the French sculptor Alain Douillard in the US. 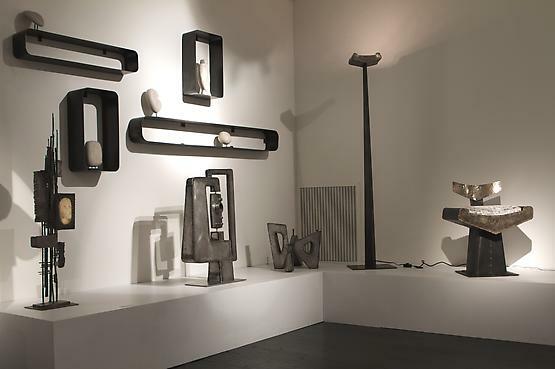 The exhibition focuses on Douillard’s metal production, from the beginning of the 1950s to today.“Le Forgeron du Fer” displays Douillard’s most prolific era. 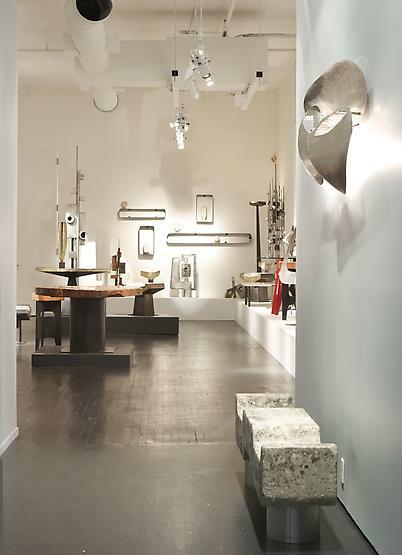 Spanning a 50 year period, the exhibition features over 70 works in sculpture and decorative arts. 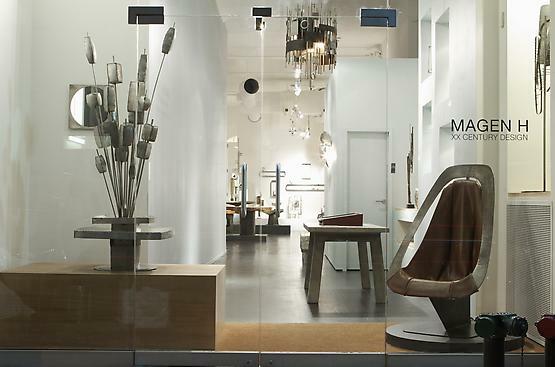 During the the post war period, the dramatic industrial expansion in France produced an excess of materials such as metal, copper and brass. These metals became an economic and common material for use among artists of the time (Philoloas, Coulentianos). 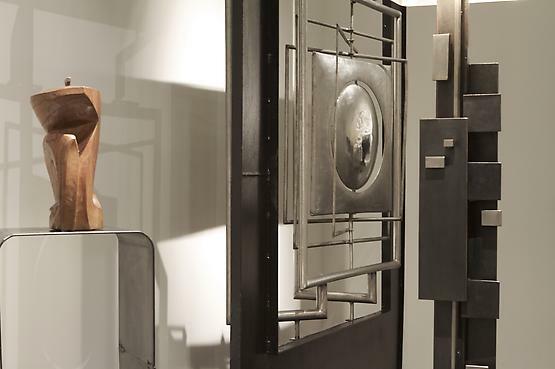 This industrial innovation gave rise to a new voice in the art world and revolutionized and elevated, through these new materials, the perception of form in sculpture and design. 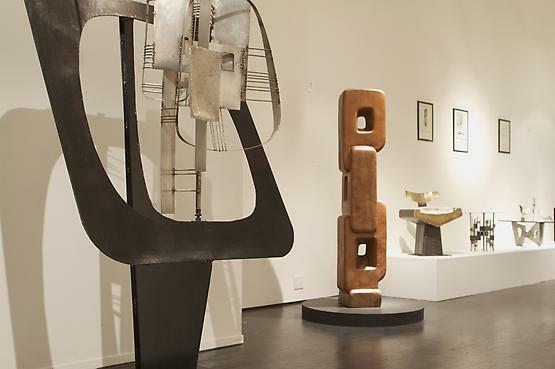 No longer limited to the previous materials such as wood or stone, artists began their exploration into approaching sculpture with a new perspective. 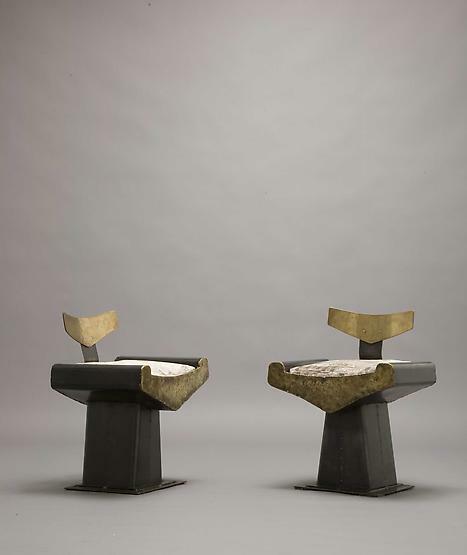 With metal, Douillard found a medium that supported his conceptual ideas previously unavailable to him through the use of conventional materials (wood and stone). During his exploration of new material, Alain Douillard transitioned from a strict academic approach to pure abstraction. 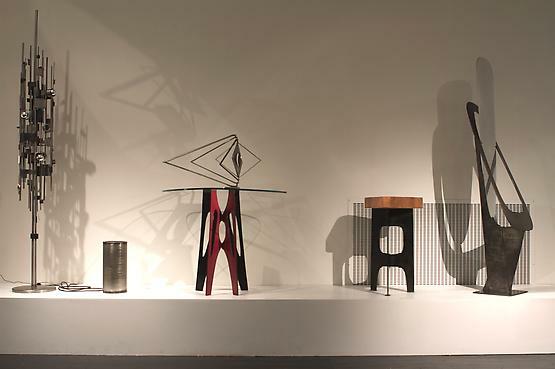 Expanding on his investigation of geometric forms, Alain was able to illustrate his fascination with intersecting planes juxtaposed in “Negative” space by manipulating metal parts to create a three dimensional object. 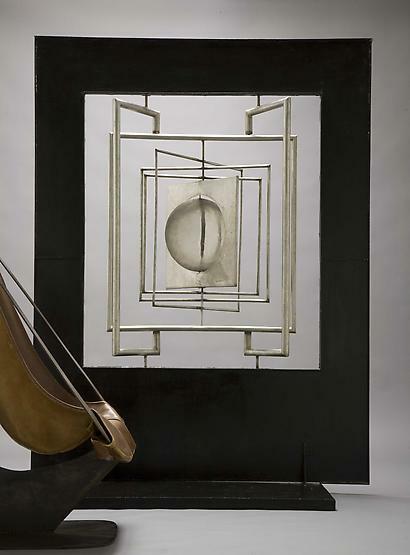 Douillard discovered an organic relation between the ragged, and seemingly dissonant elements of metal, and the organic, poetic nature of the material itself. Both aspects, the aesthetic and internal, fit together harmoniously as necessary parts of a whole. Douillard’s approach to both has always been a visceral experience as opposed to a highly intellectualized process. Entering a space of communion with the work, Douillard gives precedence to the primal aspect of creation while allowing a deeply personal experience to emerge. An exceedingly private person, Douillard’s work existsed on the periphery of the art world. His refusal to conform, and leave his home town of Nantes to live in Paris (which was typical for artists of the time) Douillard’s work remained virtually undiscovered in his remote location. Though Alain’s work was appreciated and commissioned elsewhere in France, he preferred living as an outsider and working in isolation throughout his career. 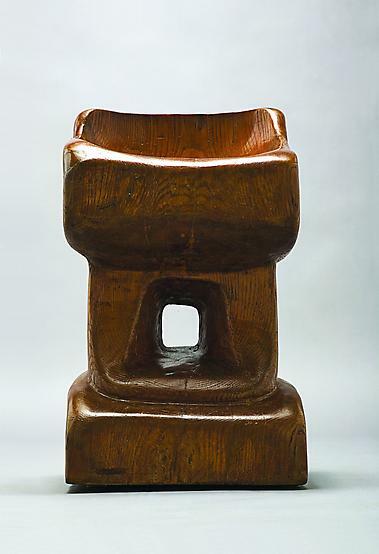 Douillard’s work was first presented as part of a collective exhibition in 1963 in Paris, France. His work has been presented in galleries such as Galerie du Fleuve (Bordeaux), Grand Palais (Paris), Maison de France (Berlin), Pavillion Francais (Frankfurt) as well as the United States. 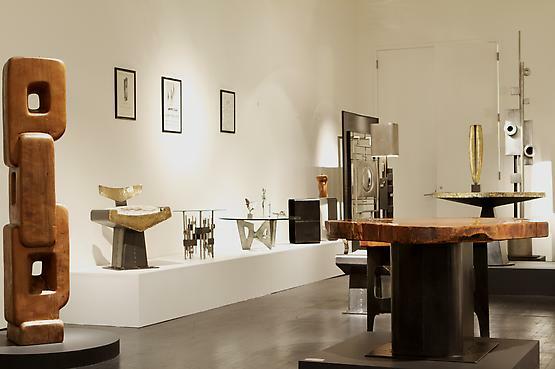 Douillard exhibited amongst esteemed artists such as Braques, Picasso, Tloupas Philolaos, Marino di Teana, Alicia Penalba, and Torun at the highly esteemed Galerie Argos in Nantes, France. He’s created commissions for offices of Credit Industriel de l’Ouest (Nantes), Hotel Sofitel, Credit Mutuel, and colleges Louis Pasteur (Saint-Mars-le-Jaille) and, Chateaucoin, (Bauge, France).